A parking is available for travelers. It is located just outside the terminal. Parking fee is L$ 50 / 30 minutes. The droff off fee in front of the terminal is L$ 50. Please acquire ticket upon entry. Due to increase in the accessing of the airport by commercial trucks for business, the airport management has institute fees for commercial trucks : truck (4-10 tyres)	US$25.00 for single access, truck (above 10 tyres)	US$50.00 for single access, equipment	US$50.00 for single access. 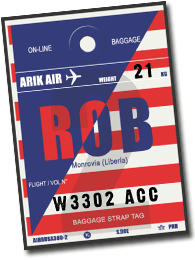 Taxis are available at all scheduled flight arrivals in Monrovia International Airport. They are recognizable by their yellow color. They do not have a meter and prices depend on your destination. Any ride must be negotiated with the driver before entering the vehicle. However count between US$10 and US$20 for a drive between the airport and downtown Monrovia. Shuttle buses and minibuses arranged by hotels circulate to Monrovia and surrounding areas. If you stay in a hotel in this area, ask them if a shuttle can drive you there. Several car rental companies offer their services in Liberia. Some of them have an office in Monrovia international airport where to pick-up your car 24h a day and others provide you with the car on your arrival.